Me too. We have a great authentic Thai place not too far from where I live. It isn’t even in Louisville. It’s in Jeffersonville, Indiana. I love that place. I haven’t been there in ages, but I contacted them awhile back and they said they could make anything gluten-free for me. That’s the joy of Thai food…it is easy to accommodate. That being said, when a sale is happening…my roomie and I tend to go a little crazy at the grocery store. No lie. A long time ago in a far away (or perhaps local) grocery store, we encountered a sale on A Taste of Thai products. 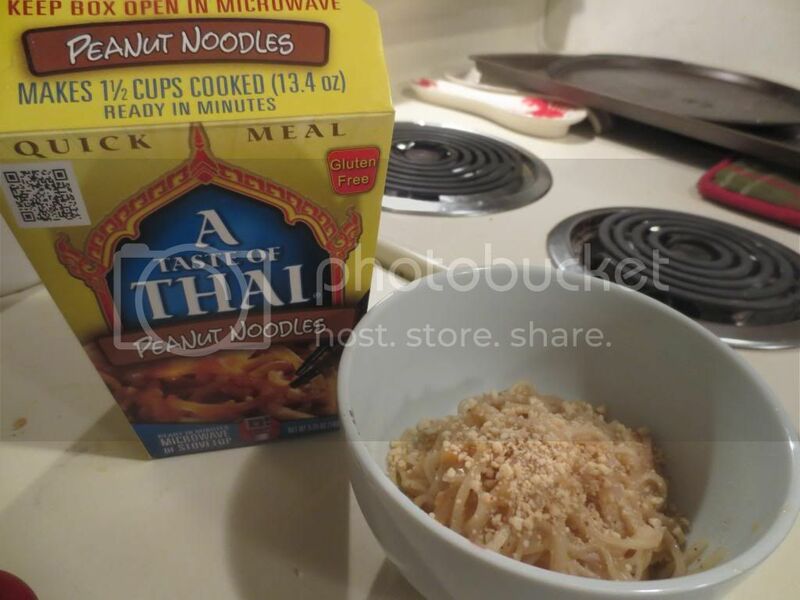 We picked up two of the Peanut Noodle Quick Meals (they serve 2 in each box) and a Pad Thai for Two…which we have yet to make as well. Tonight, after a long day of travel from Birmingham, Alabama back home…and with no CSA bin this week, I needed a quick and simple meal. Trust me, I haven’t been in the mood to get creative with the food. And, honestly, after sitting all day in the car and being the sad sot that I am right now (injured runner…stand back! ), I didn’t really want to whip up something from scratch that might take…ages. Thank goodness for these meals in the pantry. So easy to make too. Remove all of the envelopes that contain coconut milk powder, the peanut sauce, peanuts and noodles. Place a cup of water into the box and then add the sauce, the coconut milk, then the noodles. Microwave on high for 3 minutes. Stir. Microwave again for another minute. Then, let stand for 1 minute. Afterwards, add the peanuts. Stir and then serve. Simple. Easy. And ready in 5 minutes. Gotta love it. So, how was it? Better than I expected. For one thing, the “sauce” packet was a powder, which threw me off for a moment. So was the coconut milk portion as well. But those both go in the water first and they mix in all proper like. The noodles actually do soften up in the 4 minutes of heating and 1 minute of resting. I promise. 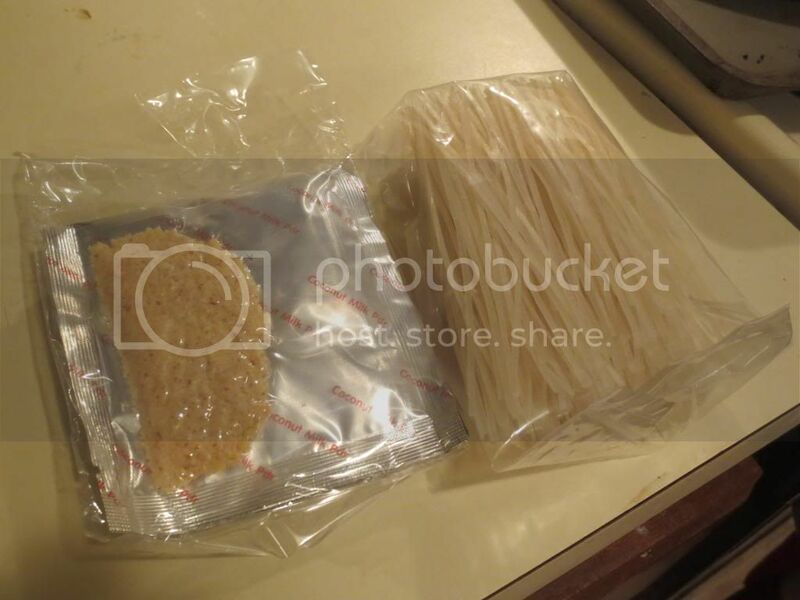 No hard noodles were found in the consuming of this product. And the flavor was awesome. Not as awesome as real Thai food, but as close to awesome real Thai food as one can get without being at an authentic Thai restaurant…or in Thailand. I swear. There was a little bit of heat…just enough to keep the flavor interesting. The peanuts gave a nice texture to the overall dish. The noodles were perfect. Not crunchy. Not mushy or sticky. Perfect. And the sauce…it was delicious. I might have licked my bowl. Maybe. A little. So, how does this stand up nutritionally? Let’s look at ingredients first. The sauce contains: sugar peanuts, chili powder, kaffir lime leaf powder, lemongrass powder, modified tapioca starch, salt, hydrolyzed vegetable protein, dextrose, tricalcium phosphate (to prevent caking), yeast extract, malic adid. The coconut milk powder is made up of coconut maltodextrin, mono and diglyceride (an emulsifier), dipotassium phosphate (a stablizer) silicon dioxide (to prevent caking). And the peanuts contained peanuts and silicon dioxide (to prevent caking). The rice noodles were simply made from rice flower, water, and modified food starch. Do I like all those modified ingredients. Not one bit. I bought these back before I was paying attention to that. Kind of shocking when I look at it and type it up. As for nutrition…this box contains 2 servings. In one of these servings, you will consume 340 calories and 10 grams of fat. Not bad for a saucy noodle dish, I think. You will be taking in 320 mg of sodium and 13 grams of sugar. The sugar is a bit high, but I believe that is from the sauce. You get 2 grams of fiber and 5 grams of protein. It is cholesterol free, gluten-free, and preservative free. So, while it is not the cleanest of eats, it was quick and easy. I do dislike the modified ingredients. Not a fan. But I am a fan of the taste, flavor, spice, and texture. For an every-now-and-again dinner, not a bad choice at all. This entry was posted in Asian, Entree, Food, Gluten-Free, Mix, Nuts, Products, Review, Sauce, Vegan, Vegetarian by The Celiathlete. Bookmark the permalink.